5373 C.S.M. Edward HUTCHINSON (HUTCHISON), D.C.M. Edward Hutchinson was born in Potton, Bedfordshire in 1879, the third son of George and Fanny Hutchison from Railway Crossing in Potton. William and Charles were his elder brothers, with Alfred and Henry being born after him. The young farm labourer enlisted into the Bedfordshire Regiment on the 25th June 1895, claiming his age as 18 years and six months old, having added two years to his life in addition to having already served in the 3rd Volunteer Battalion beforehand. He was 5 feet five inches tall and weighed 121 lbs. Interestingly, he was born Hutchinson, although enlisted as Hutchison which was the spelling that followed him throughout his military service. 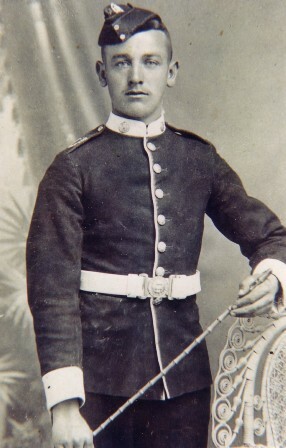 On the 21st August 1895 he was posted to the 2nd Battalion and received several Good Conduct pay awards before being promoted to Corporal on the 30th January 1903. 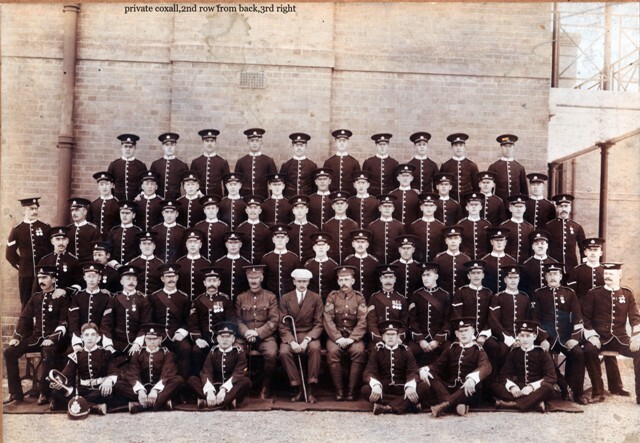 In May 1897 Edward was awarded a mounted infantry certificate, having completed the course at Aldershot, which would prove useful in the coming years. In April 1903 he elected to complete his 12 years of service with the colours rather than moving into the Reserves. 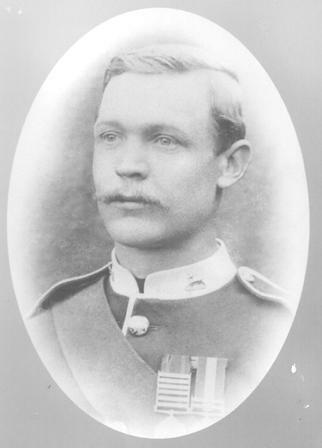 This period also saw him serve with the Mounted Infantry element of the 2nd battalion throughout the South African Wars (24th October 1899 to 8th April 1903), winning the string of clasps to his medal ribbon visible on his photograph. On the 19th May 1904 Edward was posted to the Depot and appointed a Lance Sergeant on the 13th May the following year. Whilst on station at Tidworth on the 16th April 1907, Lance Sergeant Hutchinson signed up for the full 21 years term of service and on the 29th August that year was promoted to full Sergeant. Whilst based at Tidworth, on the 29th December 1904 he returned home to Potton and married Lois Earl from the village and celebrated at the Bricklayer's Arms in the village. At this point their family started, which details read like a typical career soldier's family from the time. In June 1906 Vera May was born at Potton, followed by Edward George William and Dorothy Francis whilst the family were in Gibraltar. Lillian Rose followed in Bermuda in 1911 and Irene Lois in South Africa in 1912. There followed Gordon "Jack" in Biggleswade in 1915, Ronald, Leslie, Jean, Eric "Jim" and Victor in 1926. The six year posting at home was followed by garrison duties in Gibraltar between 28th August 1907 and 6th January 1910, then onto Bermuda until the 14th January 1912. More duties in South Africa took the battalion back there until war broke out and they were recalled to Europe, arriving on English soil 20th September 1914. Following specialised training and a quick refit for European conflict, he landed in France on the 6th October 1914 and was thrown into their first battle almost immediately. Within weeks, around 90% of his Division became casualties stopping massed German attacks intended to break through the thin British lines, earning them the nickname the 'Immortal Seventh'. Sergeant Hutchinson was wounded in the head, presumably by shrapnel, on the 23rd October 1914, during the battalion's advance against German positions north of the Menin Road during the First Battle of Ypres. After treatment at the 21st Field Ambulance, he returned to the battalion and fought with them throughout the intense First Ypres. "Coy-Sergeant Major E. Hutchison has been brought to the notice of the Officer commanding the battalion for his good work in the field. He displayed great coolness and courage throughout the whole of the operations 25th Sept. 1915 to 1st Oct. 1915, Hulloch - Loos, especially on the night 29/30 Sept., when the enemy gained a footing in the trench. He did very good work in trying to regain the lost trench and was largely responsible for stopping the enemy bombers in making any further progress." CSM Hutchinson was appointed the Acting Regimental Sergeant Major of the 2nd battalion from 19th November 1915 but reverted to CSM once RSM Thurleigh rejoined from hospital. Edward was awarded the Distinguished Conduct Medal for his actions during the Battle of Loos, which was listed in the London Gazette on the 14th January 1916, with the citation appearing in the Gazette 11th March. However, he was shipped home ill on the 29th January 1916 and was diagnosed as suffering from bronchitis whilst at No.2 Northern General Hospital. Once recovered, in May 1916 Edward became the Depot CSM of the 3rd Reserve Battalion's Command Depot at Bedford and from September 1917 was the CSM at Ampthill Command Depot. He remained on service in the UK from for the rest of the war, training recruits at Ampthill until demobilised on the 18th February 1919 having served almost 24 years with the colours. Company Sergeant Major Hutchison's career finished with a host of medals. Two were from the South Africa Wars, including the Queen's Clasp and King's Clasp, in addition to clasps for Wittebergen, Diamond Hill, Johannesburg, Driefontein, Paardeburg and the Relief of Kimberley. He also has the Distinguished Conduct Medal, the long service medal, good conduct medal, the 1914 (Mons) Star with clasp, the Victory medal and British War medal (with oak leaf). He was also presented with a leather case from old school friend at the Council School in Potton in recognition of his gallantry. Edward Hutchinson passed away at the Locomotive Inn, Deepdale, Potton which he ran with his wife. Copies of his service record including his army cook book from 1904 are kept in the Bedfordshire County Archives, Bedford County Hall. 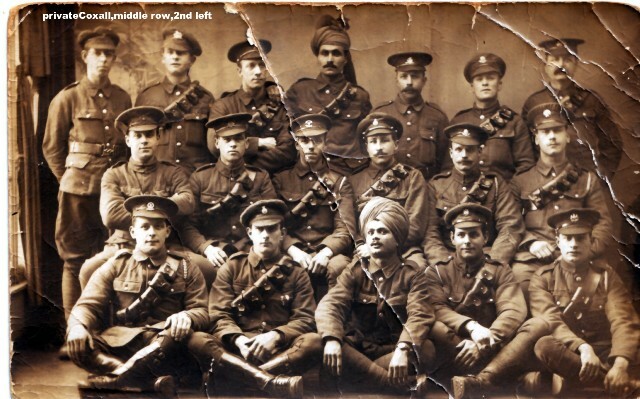 Tom Bastin contacted me about his Great Grandfather, who is shown in these photographs. Fred was born in 1881 in Yardley Hastings, Northants, the son of Thomas and Hannah Ashley, and still lived there at the time of the war. He served initially in the Northamptonshire Regiment, fighting in the South African Wars, which would have been when the first photo was taken. 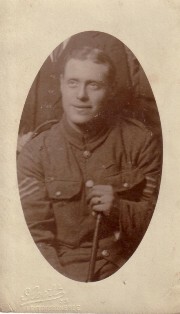 Frederick served early in the war as Private 20727 in the Northamptons, later joining the Bedfordshire Regiment as Private 43373 in the spring of 1916. He was posted to the 2nd battalion on his arrival on the Western Front and was killed during the battalion's assault near Flers on the 12th October 1916. They were the only battalion in the entire Corps to gain a foothold in the German trenches, losing over 250 men in the process, many of whose final resting place is unknown. Fred is one such soldier and is remembered n the Thiepval Memorial to the missing and his local memorial in Yardley Hastings. He was 35 years old. Sadly for Fred's family, his two brothers also fell in the war. Arthur Ashley fell on the 26th September 1917, during the Third Battle of Ypres, having served in the Territorial battalions of the Northants and Bedfordshire Regiments beforehand. He is remembered on the Tyne Cot memorial to the missing and the Yardley Hastings memorial, having no known grave like Fred. Timothy died of wounds on the 23rd May 1918, serving in a Special Brigade Gas Company of the R.E.'s. He lies in the Pernes British Cemetery. 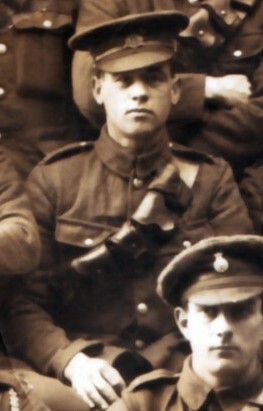 Andrew Warehand's Grandfather was James Oscar Coxall (above), who served as Private 9274 of the 2nd Battalion, the Bedfordshire regiment from the 5th February 1908 until the 4th February 1920. In the six years before the Great War he served in the West Indies and South Africa and probably Gibraltar as well, although there is no written evidence of the latter due to his service record having been destroyed. He transferred to the Transport section of the 2nd Battalion on the 23rd February 1911, which duties only a small percentage of each battalion were involved in or capable of. His time in the Transport section would have seen him constantly busy trying to meet the demands on his time and energy, sometimes with very little sleep or rest for weeks on end. Being in the Transport section would have taken particular skills and a high level of stamina that not every infantryman of the time had, making James quite a specialist within the ranks and amongst his comrades in arms. James was stationed at Pretoria in South Africa when war was declared on the 4th August 1914. Having sailed back to England with the battalion he landed at Zeebrugge with the 7th Infantry Division on the 6th October 1914 to aid the Royal Naval Division with their defence of Antwerp. Unfortunately it was too late and the Division marched south to be heavily engaged at the First Battle of Ypres on October and November 1914, where almost 10,000 of the 12,000 men in that Division became casualties during the three week battle. Private James Coxall served the entire Great War in the 2nd Battalion who were engaged in every major engagement of the war. James would have been present at the battles at Neuve Chapelle and Loos in 1915, the Somme in 1916, at Arras, Messines and the Third Battle at Ypres in 1917 and during the Spring Offensives and the final "100 days" in 1918. He served in every section of the Western Front in the four years he was there from Houthulst Forest, the northernmost section the British held north of Ypres to the southernmost area of the British lines opposite St. Quentin. He would have seen or heard of literally hundreds of men who he thought of as his friends falling as time went by and no doubt James would have lost some close friends during the war. During his time in the battalion he would have certainly fought alongside his comrades in the front lines at the First Ypres and the 1918 Spring Offensives due to the massive casualties the battalion sustained during these actions. When he was not engaged in the brutal fighting his unit were involved in he was one of the small, efficient team responsible for keeping the unit fed, watered and supplied with the endless items Infantry battalions needed to sustain their presence in the field. James finally served in the Army of Occupation after the armistice had been declared and took part (to some degree) in the clearing up operations between November 1918 and April 1919, after which he returned to complete his service in England. When James' twelve years of service had expired he chose to leave the army he had known so well and returned to civilian life, where he raised a family and lived to a ripe old age, finally passing away in 1986. Below James can be seen in a pre war photograph in his dress uniform and the bottom shot appears to be James in amongst his peers in the Divisional transport section during the war. Sergeant 8172 Leonard William HUBBOCKS, D.C.M. Leonard was born at Long Marston in 1884 and enlisted into the Bedfordshire Regiment at Leighton Buzzard, Bedfordshire on the 4th January 1905 as Private 6393. During his service he woudl spend time on both the 1st and 2nd Battalions. His father, William, ran "The Stag" public house in Leighton Buzzard in 1901 and Leonard was nearing the end of his 12 years service when war broke out, as a reservist with only 2 years left to serve. He landed with the first wave of troops in France 16th August 1914 and is a superb example of the proverbial "Old Contemptible". Having survived the ferocious opening engagements of the war, Leonard was wounded in 1915 and, on his recovery, transferred into the 2nd Battalion. Leonard was one of the handful of 2nd Battalion Sergeants who survived the "Operation Michael" battles in March and April 1918, and the photograph was taken after these huge battles (looking remarkably relaxed, considering what he must have been through just a short time before). After the strenuous weeks of fighting, the composite Battalion - by now the size of a small Company - were sent north to hold the line on a "quiet" sector at Aubers Ridge. Ironically another German offensive fell on the on 8th May 1918 and despite the flanking Battalions being overrun and withdrawing, the Bedfords stubbornly refused to fall back. Leonard was ordered to defend the open flank with a handful of men against all German efforts to overrun it that long day. Having led the dwindling group of Bedfords and fought ferociously all day he also reconnoitred the forward positions that allowed a counter attack later that evening. For his bravery under the most extreme conditions Leonard was awarded the Distinguished Conduct Medal, second only to the vaunted Victoria Cross. Leonard was wounded again, probably in May 1918, but ultimately survived the war. By the end of the war, Leonard sported the D.C.M., two wound stripes, several long service chevrons and held the "Third Class Certificate of Education" on top of his campaign medals. He was eventually discharged on the 31st March 1920, having completed a total of 11 years and 34 days serving his country in the Bedfordshire Regiment of the Regular British Army. Left are No. 3 Section of A Company, the 2nd Battalion in Gibralter 1909, en route to Africa. 2nd from the left, top row is the 19 year old Private Walter Peach who was born July 1890 and became one of the Army's fitness instructors, later training men in the "Bayonet Fencing" in Flixecourt in France, so many of our relatives would have known of him! Walter survived the war and continued serving the Army for many years in India as Warrant Officer 9030 (as shown on the right), finally passing away 30th December 1967. John Farthing got in touch and was happy to see his Great Uncle's story go onto the site. Will Peggs (seen above) was from Stratford, East London and went to Napier Road Boy's School as a young man. 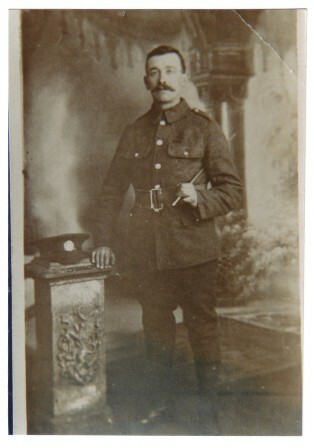 He joined the army in August / September 1911 and became a Private in the 2nd battalion of the Bedfordshire Regiment. When war was declared Will was serving in South Africa and arrived on the Western Front on the 6th October 1914. Having fought in the First Battle of Ypres when the battalion were involved in stopping the massed ranks of the Prussian Guard from breaking the thin British lines, he survived that first uncomfortable winter in the inadequate trenches. Will was involved in the action at Neuve Chapelle in March 1915 that saw Captain Foss win a Victoria Cross and himself awarded the Cross of the Order of St. George 4th Class. He would have been in charge of one of Foss' bombing teams who stormed the German trench that had resisted two previous, much larger attempts to overcome it and was mentioned in despatches on the 31st May 1915. The story of Will amd his battalion's involvement in the battle can be seen on Captain Foss' page. 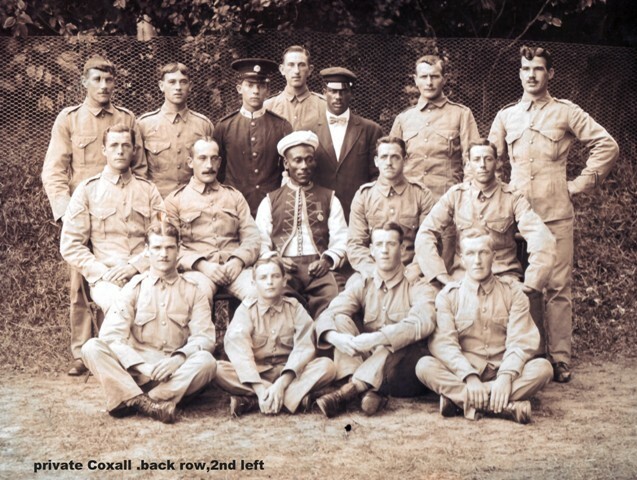 In August 1915 he was presented with the medal and the group photograph below was probably taken around then during a spell of home leave to receive the medal. Will would have also been at the Battle of Loos in September 1915 as well as in the action around Maricourt in February 1916 before surviving the opening day of the Somme offensives of 1916, when his Brigade broke the German lines at the southern end of the British sector. On the 11th July he also got through the carnage at Trones Wood on the Somme but unfortunately, Will's luck ended there. He was wounded by shrapnel in the chest, arm and buttock on the 31st July 1916, when the battalion stormed Maltz Horn Farm, south-west of Guillemont on the Somme. Havng been moved to No.21 CCS at La Neuville, he died from wounds at 9.15am on the 9th August 1916. A letter home from the Chaplain of his ward said "we all feel his death very much, for his cheery smile had greeted us all as we entered the ward and 'the sergeant' was a great favourite with us". The group photograph below shows Will seated, his brother behind him with the watch chain and other family members. 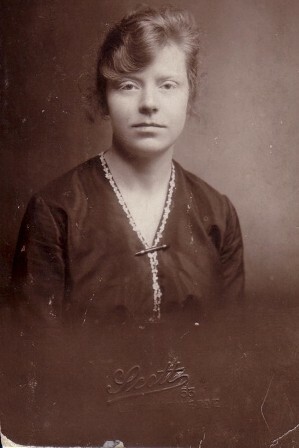 The lady in the photo by herself is Will's younger sister and John Farthing's Grandmother, who was the one to save his letters and photographs until her death at the ripe old age of 93. Her parents both died within a year of Will, leaving her to raise the family alone. Her home was bombed during the London Blitz in WW2 and it was probably then that Will's medals were lost, although his letters survived in a biscuit tin. John wrote the article below for a local magazine following his family's trip to France to visit Will's grave. It reads exactly as it was printed at the time and makes a very nice conclusion to the story. In the autumn of 1914 a young man called William Peggs boarded a troop ship in Southampton bound for Belgium and ultimately France. Will was leaving behind his mother, father and his brothers and sisters to fight for King and country in the First World War. He never came back. There's nothing remarkable about this, of course; the same thing happened to hundreds of thousands of young men. The reason Will's story is significant to me is that he was my Grandmother's brother. So it was that over 90 years later, my wife, my son and I boarded a plane bound for Paris. My main reason for going was to visit Will's grave on behalf of my grandmother who had never made the trip. My son's main reason for going was that we'd promised him a trip to Euro Disney afterwards! As I stood waiting in the check-in queue I tried to imagine what it would have felt like to be one of those soldiers going to war. I suspect that they were excited (after all, it was all going to be over by Christmas!) but I'm sure many of them must have been frightened. Will was born in the East End of London and his background was certainly not a privileged one. At a time when even travelling outside the city was a rarity, the very idea of going to France must have been daunting. We sat on the plane drinking coffee and wondered what comforts had been available to Will and his new comrades on their troop ship. Will's battalion reached France in November 1914 and spent the early part of 1915 on routine parades and in their trenches. In March 1915, the battalion was heavily involved in the fighting which became known as the Battle of Neuve-Chappelle. Will was involved in an action which resulted in him winning a gallantry medal and also being mentioned in dispatches. In 1916, during the Battle of the Somme, Will was wounded and was taken to No 21 Casualty Clearing Station (a field hospital) near Albert in the Somme valley. He died at 0915 on 9th August 1916 and was buried in the hospital graveyard. Will was 23 years old. I am lucky enough to have some of the documentation relating to Will's death, including the letter illustrated which was sent by the Sister in charge of the hospital to Will's mother. I imagine her writing several of these each week - every one a terrible blow to a mother, father, brothers and sisters. The hospital chaplain also wrote to Will's mother saying, "…we all felt it [his death] for his cheery smile had greeted us all as we entered his ward and 'the sergeant' was a great favourite with all." The hospital graveyard is now known as La Neuville British Cemetery, Corbie. It took us a little while to find it and I had ample opportunity to practise my French (not used since my school days) asking various locals the way to the cemetery. To my surprise, I was able to understand enough of the directions from one gentleman to allow me to find the lane leading to the cemetery. We parked our hire car half way down the lane (it was too narrow to drive any further) and continued on foot. It is a beautiful spot; it's impossible to imagine what it must have been like in 1916. Presumably the area would have been muddy, riddled with trenches and alive with noise and voices. The light Summer breeze just served to emphasise the peacefulness of the scene as we approached the cemetery, blindingly white in the sunshine. Many of the British cemeteries of the period (and there are lots of them) were designed by Sir Edwin Lutyens (who also designed the Cenotaph in Whitehall) and they usually follow the same layout. A low hedge surrounds the site and there is an entrance formed by two white obelisks. The graves are laid out in neat rows facing a central aisle which has an altar at one end and a memorial cross at the other. We found Will's grave in plot I.F.9 marked by the usual simple white tombstone. I stood looking at the grave and wondered what I should do next. We had been planning this trip for some time but when I arrived I realised that I'd not brought any flowers or even a pen to sign the visitors' book kept at the cemetery. I looked around me at the graves of another 887 men and realised that they'd all left people behind to fight for what they believed in. Looking back at Will's grave I could only think of one thing to say: "Thanks". We found it very hard to leave the cemetery. It was so peaceful and so beautiful - so far removed from the horror it represents. Eventually we dragged ourselves away feeling very sombre but very grateful that we'd never had to make the sacrifices our older relatives had. As for the rest of the trip, Paris was beautiful and Euro Disney was fun but, for me at least, nothing could be more moving or more memorable than the twenty minutes I spent in the middle of a field in rural France."